In March Papa left for a week to help take care of Oma in the Netherlands. She was really sick, although she's okay now. So while Papa was gone, Mommy and I did lots of fun things together. 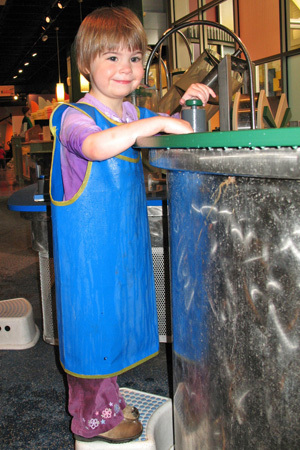 One day we went to the KidsQuest Children’s Museum in Factoria Square Mall. I climbed around in the full-size Kenworth Truck cab and sat in the driver's seat to steer it, change the gears, and push all the buttons. Then I fueled it up at the gas station. We also played some silly instruments—I liked pounding the pots-and-pans drums the best—and we put together a standing dinosaur puzzle that was as tall as I. But the best part was the water play. Mommy put a blue smock on me [left], and I experimented with hoses and pipes and buttons to make water turn wheels, move levers, and pour containers. I also floated plastic balls down the river, filled buckets and squirted streams to make music, and painted water on rocks. I had so much fun that despite the smock, I was wet all down my right side when Mommy took it off! But I didn't care; what's a little wet when you're having a blast? While Papa was gone, Mommy also took me to another of my favorite places, the Woodland Park Zoo. 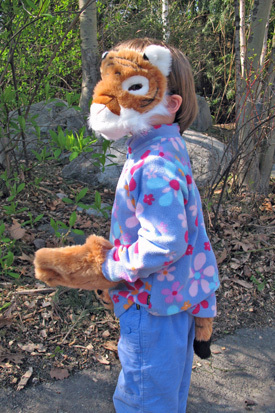 When we were done looking at all the animals, we stopped at the gift shop, and Mommy bought me a tiger costume. I like costumes; at daycare, one of my favorite activities is to wear a costume of Tigger from Winnie the Pooh. I say, "I want to be a Tigger-tiger." I loved the tiger costume Mommy bought so much that I had to put it on right there and wear it at the zoo [right]. And that night, when we drove to the airport to pick up Papa from his trip, I surprised him by wearing my new tiger costume. He was so glad to see me! 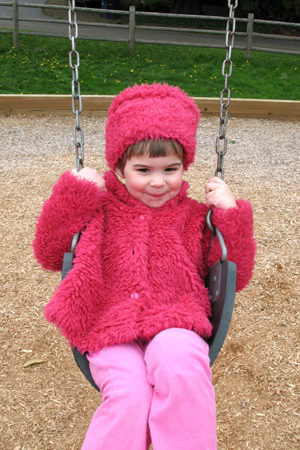 Now that spring has arrived, Mommy and Papa have been taking me to lots of parks to play and eat picnic lunches. Some of my favorites places are Wilmot Gateway Park in Woodinville because it has a giant sand box, McAuliffe Park in Kirkland [left] because it has lots of ladders and slides, North Rose Hill Woodlands Park in Kirkland because it has a castle and a spaceship, Crossroads Park in Bellevue because it has so many ladders and bridges and climbing things, and Juanita Beach Park in Kirkland because I love to play at the beach. 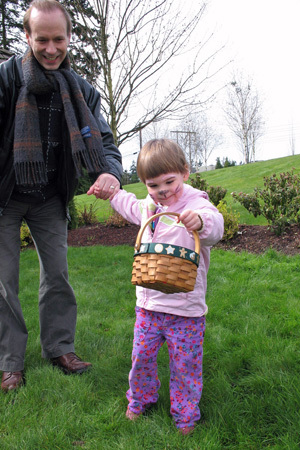 On March 31st, Cascade Ridge hosted an Easter egg hunt for all the kids in the neighborhood. Just like last year, it was cold and rainy, but I didn't mind too much. Mommy and Grandma Joanie were already there when I arrived from Oranjeschool with Papa. All the kids brought baskets, and we were told that we could each collect six eggs. When Miss Lynette said "Go," I hurried to find my eggs. Lots of bigger kids rushed past me, so Papa helped me [right]. As soon as I saw the first bright plastic egg in a bush, I knew there had to be chocolate inside—and I was right! The party was fun: I had my face painted like a pink bunny, raced with an egg in a spoon (Mommy helped me because I didn't really know what a race was), made bubbles with a giant bubble wand, planted flower seeds in a small pot, decorated a bag with spring flowers, and ate Mommy’s pink and yellow bunny cookies. April 8th was Easter. When I woke up, I found an Easter basket outside my door left by the Easter Bunny. In it were a solid chocolate bunny, jellybeans, gummy bunnies, a board book version of The Velveteen Rabbit, a Dutch bunny board book, a rubber ball, pastel Play-Doh, and a miniature container of bubbles. Mommy said I could wake Cameron up (he always sleeps late), so I took his basket in to him. He was glad to see chocolate, too. Then we all went downstairs, and right away I saw bright plastic eggs. So Cameron and I searched for all the eggs the Easter Bunny had hidden while we were asleep. There were 40 altogether, and nside each one was more chocolate! He also left a soft, yellow bunny on my eating chair. Later I put a pair of my plastic underpants on it and pretended to feed it. 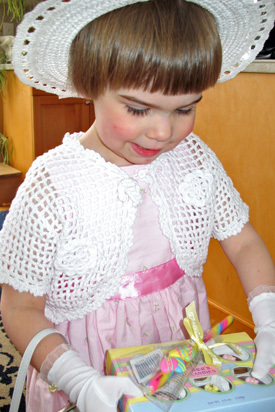 After breakfast Mommy dressed me in my Easter outfit: a pink dress, pink anklets, white patent leather shoes, gloves, a woven hat, and a shiny white purse [left]. It was very special. After Grandma Joanie arrived, we had an Easter lunch of salmon, rice with mushrooms, green salad, French bread, and carrot cake. The only things I liked were the mandarin oranges in the salad, the bread, and the cake. After Grandma left, we drove Cameron to his dad’s house. It was sunny outside, and I ran around the yard and had a good time—until I peed in my pants and got my pink dress wet. Luckily, Mommy put another dress on me to go to Grandpa's house for dinner. But by the time we got to Grandpa's, I wasn't feeling very well, and after a while I threw up on Papa's shirt. Mommy and Papa couldn't decide whether I had a virus or I'd eaten too much chocolate.... Nah. No one can have too much chocolate! Mommy and Papa gave me a tricycle for my second birthday, in 2006. But for a long time my legs were too short to reach the pedals. Papa even attached pieces of wood to make the pedals thicker, but I still couldn't reach them. Later, even when I could reach the pedals, I had a hard time making them move around, and I didn't understand how to steer. 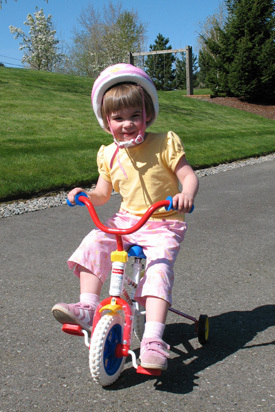 Finally, on April 6, 2007, I figured out how to make my tricycle go [right]! 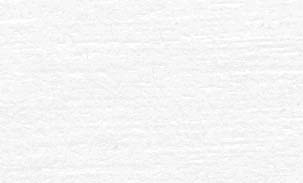 I was very excited and proud of myself. 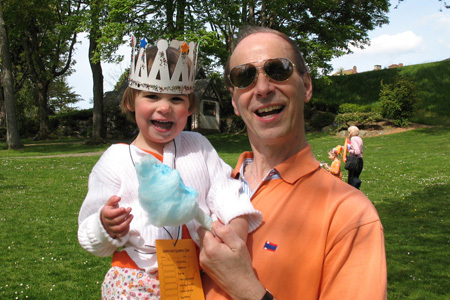 On May 6th, Papa, Mommy, and I drove to Magnolia Park, in Seattle, to celebrate Koninginnedag. The Holland America Club sponsored a big party for children and families. When we got there, they put a game card around my neck, and said that if I played three different games (because I'm three years old) and collected a sticker for each, then I would earn a prize. There was a big inflated castle to jump in, paper crowns to decorate, and popcorn and cotton candy [left] to eat—my favorite! To fill my game card, I raced in a potato sack with Papa, played sjoelen. and fished for plastic eggs with a net on a pole in a kiddie pool. For my prize, I chose a black and white plush cow with long arms to hug me. Now he sleeps with me in my bed. May 11th was Mommy’s birthday. For breakfast she took me to Krispy Kreme in Issaquah. First, we watched the doughnut machines through a big window as they cut holes in the dough, dipped the doughnuts in hot oil, flipped them onto a conveyor belt, and sprayed them with icing. Then a woman used long tongs to take them off the conveyor and put them on trays. Those trays went into the display case, from which Mommy and I chose six different doughnuts to sample. Then I ate my very first doughnuts! 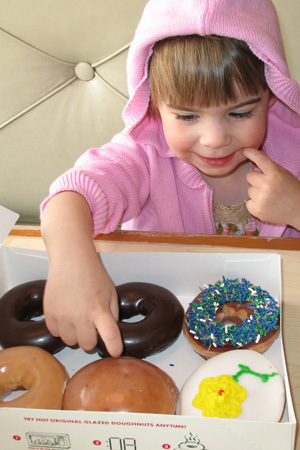 I devised a special doughnut eating technique: First I poked them [right]. Then I licked the icing. Then I nibbled them in concentric bites around the hole, leaving just a little bit of dough in the middle. They were delicious. My conclusion: birthday doughnuts are a very good thing. 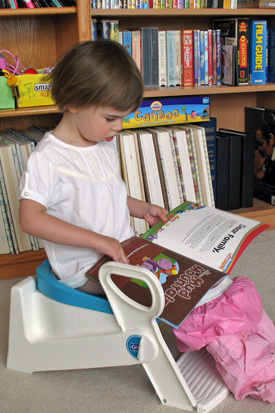 I first used the potty right after my third birthday in late January, but it's taken me a while to get the hang of it. Sometimes I'm sure poor Papa has wanted to tear his hair out (but he hasn't because he doesn't have enough hair to sacrifice). Mommy and Papa tried lots of techniques to encourage me. Mommy bought pretty underwear that she promised I can wear when I use the potty consistently. They tried to bribe me with jelly beans and gummy letters. They even gave me new books to read while I sat [left]. But what finally helped me turn the corner were the "poo-poo presents"—small wrapped packages that I can open if I choose to "take care of my body" and use the potty by myself. The first day they put a present out I was upset because I just wanted to open it, but the second day I earned the present by pooping on the potty all by myself. And I've been doing that (almost) ever since! Mommy promises that if I keep doing such a good job, I can wear those pretty underwear very soon!